Opposition lawyers to Court to file a case against CID boss and the President. - Bana Kenya News, Real African Network Tubanane. Home featured Nairobi Opposition lawyers to Court to file a case against CID boss and the President. Opposition lawyers to Court to file a case against CID boss and the President. The opposition has now shifted the fight between the Mombasa Governor Hassan Joho and the President to a new level. The Opposition lawyers are now taking the matter to court for proper interpretation. 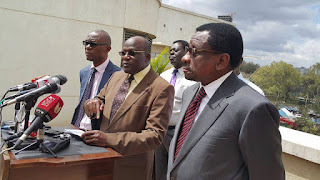 The lawyers led by the Siaya senator James Orengo, Former attorney general Amos Wako, Makueni Senator Mutula Kilonzo Jr and Kakamega senator Bonny Khalwale will file cases against some government officials. The first case will be against the CID boss Ndegwa Muhoro. The team will establish whether the forged the document that involved the Mombasa governor was a fix. The lawyers will need to know the source of the 1992 fake document because it is speculated that the CID created a forged document and then presented it the KNEC for verification. The second case will be the interpretation of the words used by the president in Mombasa. "Tutawanyorosha........" in particular. The Siaya Senator James Orengo said about the statement made by the president in Mombasa that it tells a lot about the Coast leaders and the people as a whole. In addition to that, the statement literal means he will deal with "Coasterians." The main question here is how he will deal with them? The third and last file will determine how to handle abuse by the court. The team will seek advice from the court about the what it means by "hate speech". Last weekend, the ODM leader was told by his senators that they are preparing a vote of Confidence in the senate. The senators vowed to impeach the president if he will not stop using abusive language.